How To Make A DIY Cupcake Stand To Match Any Party Theme! 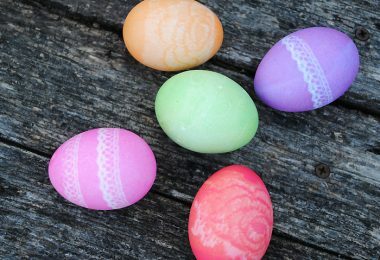 Looking for some ideas for DIY party decorations? Have no fear, you can learn how to make a DIY cupcake stand! 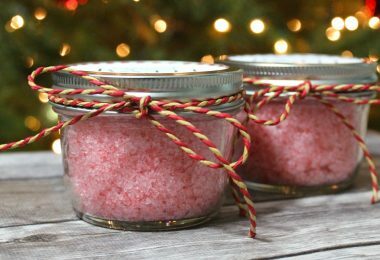 Here’s a tutorial on how to make it, this is one of my favorites! 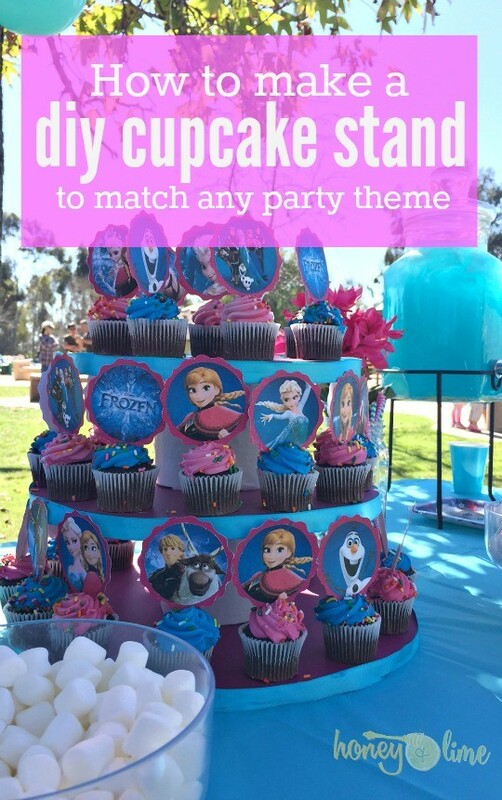 You can totally make your own custom tiered cupcake stand for cheap to match your party’s theme, no need to buy one of those expensive cupcake stands if you don’t want to! 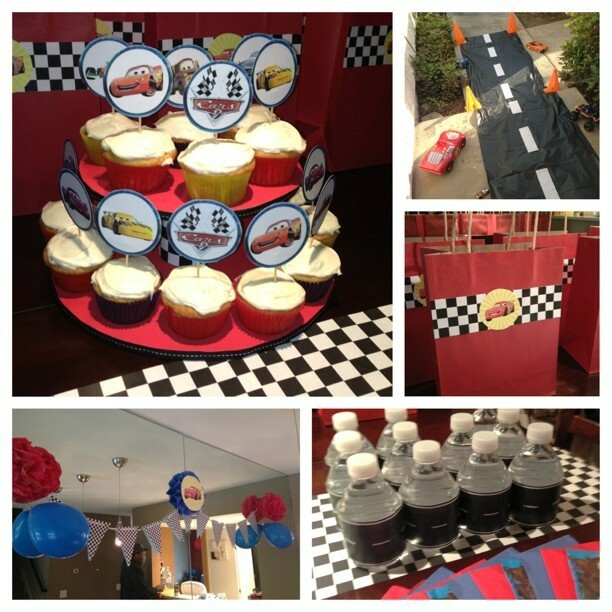 I’ve made these DIY cupcake stands for plenty of parties, my daughter has had a Disney’s Frozen birthday party themed cupcake stand, a Minnie Mouse birthday party theme cupcake stand, and my son has had a San Diego Padres birthday party themed cupcake stand and I also made him a 2-tiered Disney’s CARS cupcake stand. They serve as practical cupcake holders and double as great DIY party decorations for dessert tables! Read on and I will show you how to make a DIY cupcake stand. Let’s learn how to make a DIY cupcake stand, first, make sure you have all of the materials above. Got them all? GOOD! 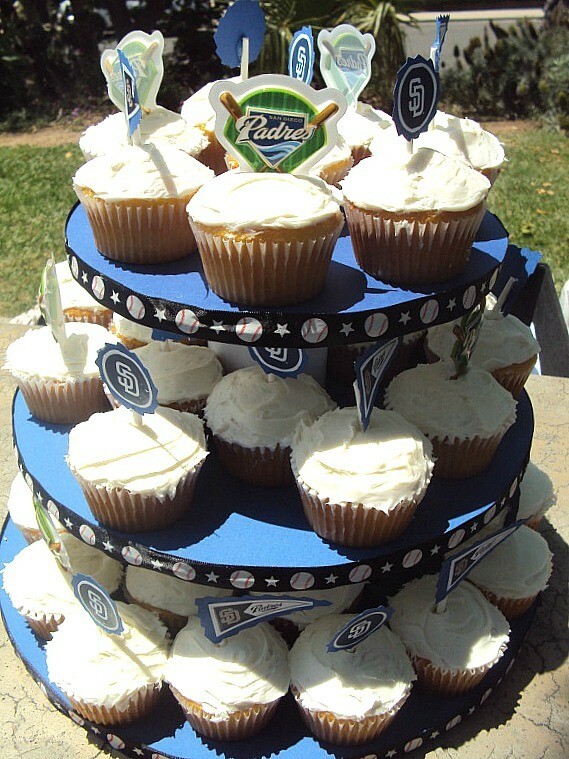 For this tutorial, we were making the San Diego Padres cupcake stand. First, grab your cardboard cake rounds and glue each of them to each others’ match. This means that the 8 inch will be glued to the other 8 inc, the 10 inch will be glued to the 10, and the 12 inch should be glued to the 12. Got it? This step should leave you with 3 doubled cake rounds, making each of the levels of the DIY cupcake stand nice and sturdy. 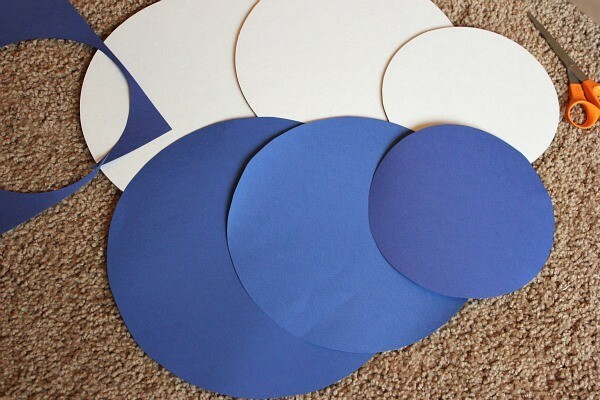 Trace each cardboard cake round onto your colored paper, cut out each circle and glue them onto each of the 3 cake rounds. 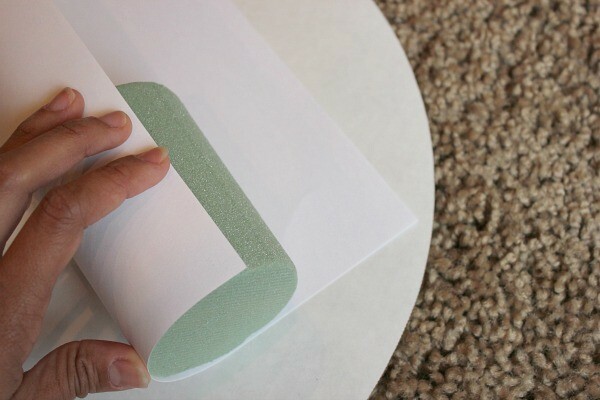 Measure your preferred color of paper around each of the two Styrofoam cylinders, try to over measure just a but so that when you wrap the paper around the cylinder, it overlaps. 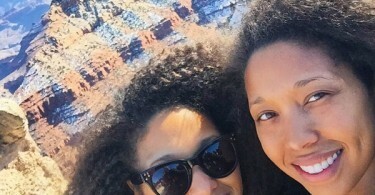 That way, you can glue the underside of the paper so it won’t be seen. Note: I found the perfect cylinders at the dollar store, if you are not able to find some that are tall enough to separate the tiers, purchase (4) of these floral Styrofoam discs, pair them together, and glue to make two tall cylinders. Other DIY cupcake stand ideas use cans in the center, but I thought they might be to heavy. Now it’s time to put this DIY cupcake stand together! 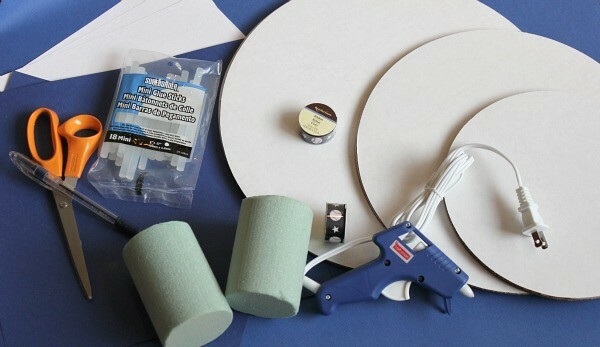 With the largest 12 inch cake round on the bottom, colored paper side up, carefully use a generous amount of hot glue and affix one of the cylinders onto the very center of the cake round. You can grab a ruler and measure to 6 inches in from the outside and lightly mark the center with a pencil. Allow a few minutes to cool. 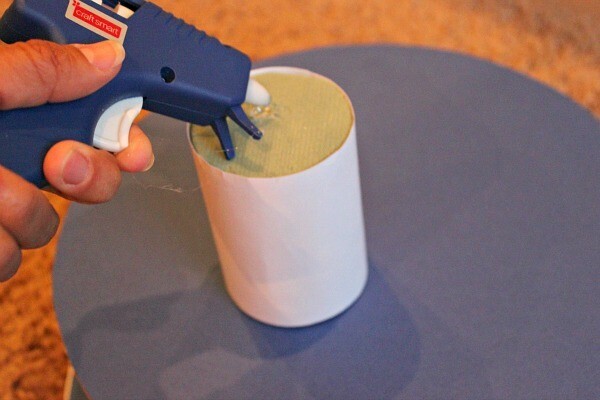 Put a generous amount of hot glue onto the top of the cylinder that you just glued on, grab the 10 inch cake round and glue it to the top of the cylinder. Make sure it’s in the middle! Next, hot glue the second cylinder to the top of the 10 inch cake round, make sure it’s in the very middle and lines up with the first one! Again, you can measure to 5 inches in from the outside and mark with a ruler. Spin the cupcake tower around and look at it from all sides to be sure it’s in the right place before you glue it on. Add glue to the top of that cylinder and affix the 8 inch cake round to the top. Carefully measure out your ribbon around the exposed edges of each cake round and hot glue all the way around. We were having a Padres baseball party so I chose baseball printed ribbon. Allow your DIY cupcake stand to dry for at least an hour before using. 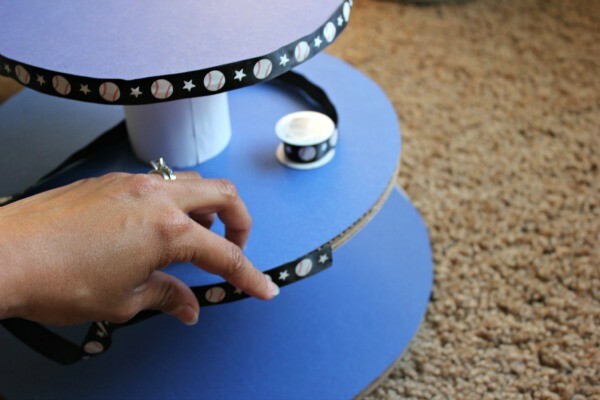 See, it’s easy to make your own DIY cupcake stand with cardboard! Which one is your favorite? Any questions about making a DIY cupcake holder? Got any other DIY cupcake stand ideas? Let us know, and ask questions in the comments below and i’ll try to answer! 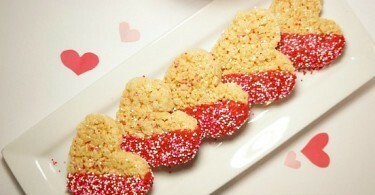 Also see How To Make Ice Cream Cone Cupcakes and this Super Fun Baseball Pull Apart Cupcake Cake, more fun party ideas! Enjoy making your DIY party cupcake stand!